Western Herbal and Nutrition, Inc. is committed to being a trusted provider of quality herbal and nutritional supplements since 2002. We are driven by our deep passion to develop safe and effective natural alternatives that provide lasting benefits. As a concerned parent, I often here the discussion at schools – does ADHD exist? This question has nearly as many answers as there are people willing to voice an opinion on the subject. There has never been a consensus about the validity of the ADHD diagnosis in large part because researchers had, until recently at least, found no evidence of a biological cause. The question is further confounded by the fact that the criteria doctors use to diagnose the disorder are common behaviors that nearly all of us have demonstrated at some point: failing to pay attention to details, having difficulty waiting in line, and so on. More and more Americans are being affected by the disease of Gout. For anyone that does not know, the effects can be debilitating in restricting mobility, and pain to the given joint can be excruciating to the point where it seems every nerve ending seems on fire. Worse yet, Gout attacks may manifest themselves in different parts of the body each time a new attack comes around. Furthermore, one of the most commonly prescribed treatments for Gout has the potential to spread Gout to just about every joint in the body. I have heard several customers over the years explain that they had a diagnosis of Gout in their big toe, began a prescription regimen, only to see Gout spread to other parts of the body. According to the website Science Daily, in the last twenty years, the US has seen a rise in rates of those afflicted with Gout. Between 1960’s and 1990’s, the rate of Gout has doubled in the US. It is estimated that Gout now affects some 8.3 million or 4% of Americans. The article goes on to point out the possible connection between the rise in obesity, high blood pressure, and insulin resistance. I believe that this confirms that the average American diet is less healthy today than decades past. Unfortunately, the internet these days is full of all the wrong dietary recommendations. In fact, many of the foods suggested for Gout sufferers will only work to make symptoms worse. It is critically important for those suffering with Gout to understand and adhere to a healthy dietary plan that will help them control and maintain proper uric acid levels. Doctors consider Gout to be two things: incurable, and progressive. I do not take that view. I have daily confirmation that the progression of the disease can be effectively managed through proper diet and supplementation. Addressing Gout is not just about chasing away the painful symptoms. It should also include a long term focus on keeping uric acid levels in a normal range. Hyperuricemia is the medical term which describes increased uric acid levels in the body. The mystifying part is that someone may test for high uric acid levels, while never experiencing symptoms of Gout anywhere in the body. Yet, I would urge anyone to take careful note – high uric acid levels can be damaging.A doctor, who orders Gout-Relief, explained it best. She said Tom, “Though I am a doctor, I take your Gout-Relief product and it works very well.” But she went on to say, “You know Tom, uric acid is one of the most destructive substances to the human body. It eats bone, cartilage, joints, and skin.” I knew everything she said to be true, yet the way she stated it really resonated with me. I consider her comments to be a good case point for doing everything in ones’ power to keep uric acid levels in the normal range. Barring any such focus, people may have degrading joint and organ damage without being aware that the culprit is in fact Hyperuricemia or Gout. There are several strong negatives to the use of prescription medications designed to target Gout symptoms. Firstly, none of them are a cure for the condition, and commonly the prescriptions are less effective the longer someone takes them. I recall a customer who summed it up very well. He told me that he had been taking Allopurinol for 20 years, and said it used to work for him but now does nothing. His experience is not unique and stands to reason. Almost without exception, every common prescription for Gout can induce liver damage, and in many cases kidney damage as well. Liver and kidney function are closely related. Gout is a form of Arthritis and also a kidney disease. It does not make much sense to take a medication that can damage your kidneys, when that is the very organ that one needs to control Gout. Over the years, I have spoken with several customers who had their blood tested for uric acid levels. Then, after taking Gout-Relief for several weeks, they have seen their uric acid levels drop to a normal range after being retested. Gout-Relief can quickly chase away all of the symptoms of Gout, usually in just a couple of days. Continuing with a maintenance or preventative dose (2-4 tablets daily) will keep future Gout episodes at bay while working to normalize uric acid levels. I encourage anyone with Gout to give Gout-Relief a try; it is safe, no side effects, fast-acting, and a very progressive natural supplement. Helps alleviate symptoms associated with gout. Helps supplement essential vitamins, often missing in low-purine diets that help the body breakdown and reduce excess purines and uric acids. GR-911 does all this without harmful side-effects! For those looking for natural ways to maintain or improve their heart health, we reviewed several highly recommended supplements and their benefits. Essential for heart health. At least 100 mg. daily up to 200mg. or more for smokers or those with a circulatory disease. Maybe the most significant herb for helping with the health of the heart. The constituents nourish the heart muscle and strengthen it. Hawthorne Berry is a very gentle herb, and works over time. There are no side effects, and it is considered to be very safe. An amino acid found in meat. Essential for proper functioning heart. The highest concentration of this essential amino acid SHOULD be found in the heart. Many people are deficient in this important protein source. Recommend at least 500 mg. daily. Naturally high in natural Niacin, Cayenne promotes healthy circulation and dilates the blood vessels. Considered to be cleansing to many organs. Very safe. Two 500mg. caps up to 3 x daily. Trying a progressive formula with a complex of herbs would be recommended. A product called Heart Formula can be found in liquid form, 20 drops in water 3x daily. Imbalanced blood sugar creates a host of health problems. It causes stress to the Adrenals, Kidneys and other organs and may promote high blood pressure. A significant formula called Blood Sugar Harmony is designed to normalize blood sugar levels. This product includes Chromium Nicotinate which is an essential factor to controlling insulin triggers. Helps to build muscle, and supports better utilization of proteins. Also helpful for weight loss. Numerous studies point to the ability of Garlic to help normalize cholesterol levels and lower high blood pressure. Also helps to build resistance to colds and flu, and helps to rid the body of toxic heavy metals. Many Herbalists consider Astragalus to be the MOST important herb for promoting healthy immune function. The benefits are many. It helps with digestion and elimination of waste products, and increases metabolism. It is further believed to protect from high blood pressure, arrhythmia, and improve overall cardiac function. It also helps to prevent formation of fatty plaque deposits in the arteries. Other benefits extend to helping with anemia, renal failure, diabetes, eyesight, liver and kidney function. Astragalus should be one of the first things you reach for during cold and flu season. Many studies have been done to show the benefits of this incredible extract. The conclusion of these many studies give Resveratrol ‘fountain of youth’ type of billing. It may be one of the most significant supplements one can take to promote a healthy body on many different levels. Reseveratrol helps to reduce inflammation, it helps to lower bad cholesterol. It is thought to limit the spread of cancer cells as well as protecting nerve cells from damage and arterial plaque buildup that can lead to Alzheimer’s disease. Diabetes can be helped with this supplement due to its’ helping to reduce insulin resistance. Studies with animals show an increase in lifespan and reduction in obesity. Recommended dose is 60 to 200 mgs. daily. It may be more beneficial to chew the tablets before swallowing as the tissue in the mouth absorbs Resveratrol directly. Green tea has also become the focus of much study. The active ingredient is called ECGC which is a powerful anti-oxidant that promotes numerous health benefits, including weight loss, lowering bad cholesterol and risk of heart disease. Additional studies show that ECGC kills cancer cells and benefits patients battling many types of cancers. It further helps with inflammation, helps with blood sugar, protects the liver, fights infection, increases metabolism, and may help combat digestive disorders such as diarrhea and influenza. Green Tea extract is also thought to slow the aging process and boost cognitive function in part because it is high in the amino acid call L-Theanine which helps the brain produce Dopamine. L-Theanine found in Green Tea extract also helps to increase the body’s resistance to colds and flu. Recommended reading: Dr. Stephen Sinatra in his book The Sinatra Solution, Metabolic Cardiology promotes the use of many of the supplements outlined here; especially CoQ10 and L-Carnatine, Garlic and Hawthorne Berry among others. All of the supplements mentioned in this article may be found at www.westernherbal.com. Our customer service is highly trained to address your questions. Our toll free customer care department is available Monday thru Friday, 9-5, Pacific Standard Time. We wish you a happy and healthy 2015. This article is for informational purposes only, and has not been evaluated by the FDA. If you have a medical condition or are taking prescription medications, we recommend talking to your doctor or qualified medical practitioner. This information is not intended to treat, diagnose or cure any condition. Topical solutions by and large are ineffective for treating Haemorrhoids. The best of creams or ointments may bring some temporary relief or easing of symptoms, while some may actually make matters worse. Suppositories, medicated wipes, and even cryogenic devices may be well intended but often end up irritating this most delicate tissue. The reason is quite simple; haemorrhoids are not just a topical problem. Many doctors treat the issue as if it was just a slight affliction that can be chased away with some steroid based cream or use of suppositories. Worse still, many doctors seem to dismiss how exceedingly painful and debilitating haemorrhoids (piles) can be. Very likely you may have discovered all this already for yourself. You would not expect a cream to completely solve Arthritic complaints, nor should you expect a cream or topical application to have long term merit for solving haemorrhoids, whether they be internal or external. Did you know that more than 8 million Americans suffer from gout, according to the University of Maryland Medical Center? As our population continues to age, the number of people who are diagnosed with this painful form of arthritis is expected to increase. As a result, there will be a greater need for natural supplements such as GR-911 for those who are experiencing symptoms due to a flare. However, it’s important that people are properly informed of what the symptoms of gout are and that they know when to seek out professional assistance for an accurate diagnosis. Starting with the first on this list, asymptomatic hyperuricemia patients will likely not experience any pain, inflammation or other suffering but will have high levels of uric acid within their systems. Once at the acute stage, a patient will first start experiencing irritation to his or her affected joint. The time in between gout attacks is known as intercritical gout, and chronic cases are the most painful and may occur after long-term suffering. Symptoms to watch out for As uric acid levels first start building up within the body, you may experience warmth, pain, swelling and tenderness to the affected joint. Most commonly, this takes place in a patient’s big toe, but it can also be felt in the ankle or knee joints. Generally, sufferers have reported pain during the night that can last for hours at a time. Some other signs that you may be suffering from gout include red or purplish skin in the area you are feeling discomfort and/or limited mobility of the joint. If you believe you are exhibiting gout-like symptoms, talk to your doctor immediately. In addition to too much caffeine, stress is a common cause of a poor night’s sleep. There are many natural and herbal sleep aids for sufferers to consider. 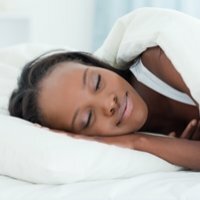 Women’s Health magazine explains that the definition of “a good night’s sleep” has changed. Waking in the night should not be a cause for alarm; it is completely natural. However, the instant panic of waking in the middle of the night may cause stress and make sleep even more difficult. The deeper stage of sleep, rapid eye movement (REM), occurs about every 90 minutes. In between stages of REM, our brains may become more alert, which can cause you to awake. Rather than panic that you will not be able to fall back asleep, alleviate any physical annoyances – an ache or cramp, or needing to use the bathroom. Simply knowing that it is natural to awake may prevent stress and make falling back asleep easier. Try not to look at the clock and panic. Instead, relax your mind to help you drift back to sleep naturally. In correlation with herbal sleep remedies, a bedtime routine can make this easier. Relaxing your body in preparation for bed works as a natural sleep aid. Something as easy as stretching before bed will release tension and stress from your body. Yoga has great poses that may help you achieve relaxation. Performing these stretches before bedtime will allow your muscles relax and your brain to follow suit. If you awake in the middle of the night or find yourself laying in bed for more than 15 minutes, try to relax. Performing your bedtime routine again may help. You might also want to leave the bedroom and take on a calming activity. Listening to soothing music or an activity such as knitting can help you to feel drowsy. Once you do, you should go back to bed and will likely find it easier (if not easy) to get back to sleep. Try not to partake in stressful activities – like checking your email – prior to heading to bed. This may have the opposite effect on your brain. Dimming the lights in a room about an hour before you plan to get to sleep can also act as a natural sleep aid. Herbal sleep remedies are another option to aid in a stress-free night’s sleep. You may find yourself having a difficult time sleeping due to stress if you have changed work schedules, suffered a traumatic event or are suffering from depression. It is important to get enough rest if you want to keep your mind, waistline and immune system in check. This natural oil (also known as Linseed Oil) is highly recommended for the general well being and whole body nutrition and is considered to be one of the richest source of omega-3 fatty acids that are required for the health of almost all body systems.